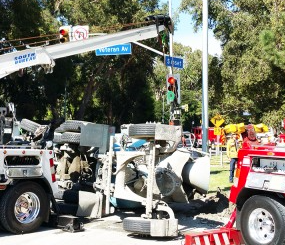 An overturned cement truck on Sunset injured three and blocked traffic for hours. A cement truck overturned on Sunset Boulevard, clogging the busy thoroughfare for three hours and sending three people to the hospital. The September 2 wreck shows what could easily happen when thousands of heavy construction trucks will crisscross Sunset as part of the Archer School expansion. The wreck occurred at about 1:40 in the afternoon, shutting down traffic in both directions well into rush hour. The cement truck was headed northbound on Veterans Avenue near UCLA when it crossed Sunset and overturned. Cement truck drivers can be in a hurry to meet delivery times, and to unload their cargo before it starts to dry. An Atlanta study showed that cement trucks – often loaded with as many as 70,000 pounds of cargo – often run red lights, and can become so top heavy that they can easily overturn, crushing nearby cars and pedestrians.